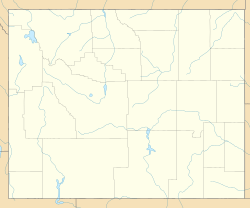 Winton is a ghost town in Sweetwater County, Wyoming, United States. Winton was 5 miles (8.0 km) north-northeast of Reliance. Winton is sometimes referred to as Megeath. Megeath Coal Company owned a Post Office named Winton. Union Pacific bought out Megeath and changed the name to Winton. Lawrence Welsh, the fourth Bishop of the Roman Catholic Diocese of Spokane, was born in Winton. ^ "Bishop Lawrence Harold Welsh". Catholic-Hierarchy.org. Retrieved October 12, 2018. This page was last edited on 13 October 2018, at 07:11 (UTC).